You might remember the sweet & talented Krissy from our Milk Bar Monday series. Today is all about Krissy because she is having a baby boy! Surprise, Krissy! A few of her blogging buddies decided that it would be a great idea to honor Krissy and soon-to-be son Ezekial (isn’t that an amazing name?)! Krissy is so sweet and I am honored to call her friend! She is so hard-working, always coming up with some amazing recipes (see: homemade ladyfingers) and I know that she will be an amazing mother! I decided to do a little savory dip for Krissy’s shower. You all know how I feel about snacks, dips and appetizers and this new one is one to save. 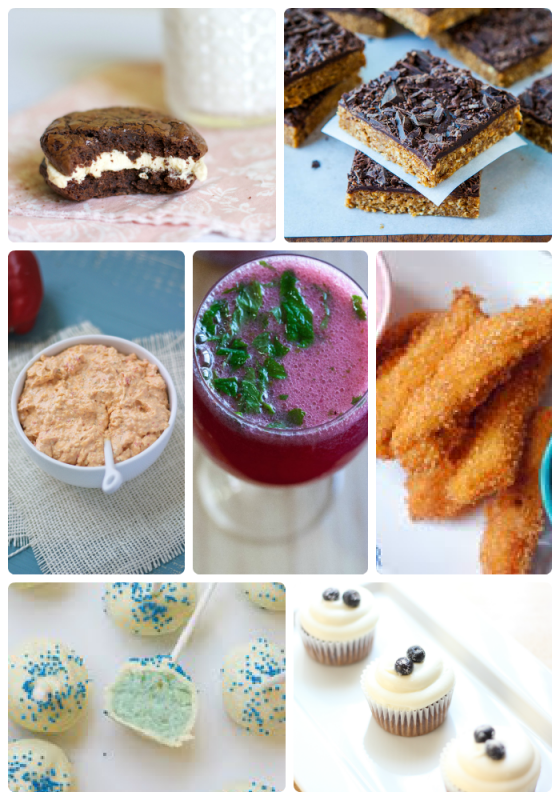 It’s so, so simple and the flavors are sure to please adults and kids alike. You probably also know that I’m not really a fan of ranch but I did use some of the seasoning mix in this recipe and it adds a great herb flavor to the dip. I mixed cream cheese, cheddar cheese and Parmesan cheese which adds a lot of layers of flavor! I can’t wait to “meet” Ezekial, I am already sure that he will be picture perfect. I wish you and your family all the best, Krissy! 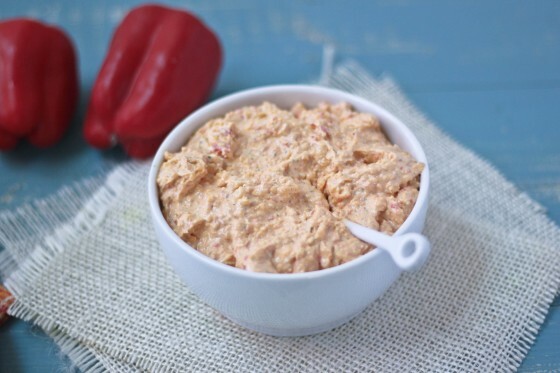 A quick and simple appetizer: red bell peppers, ranch mix and cheese combine for a people-pleasing dip! Combine all ingredients in a food processor and process to combine. Transfer to a bowl, cover, and refrigerate for 30 minutes. Serve chilled. After this refrigerates, it sets fairly well. So you can easily roll it into a ball and serve as a cheeseball. If you don’t have a food processor, dice the red pepper as finely as possible and mix all ingredients until well blended. The dip won’t be as smooth but still should come together. This dip sounds great Cassie! I’ve been looking for ideas for an upcoming football party I’m having- this sounds perfect! Yay Krissy! y’all are SO SWEET. and I want to drink this dip. This dip looks delicious… I might have to add it to our football snacks one day! Oh wow this dip looks delicious! I bet this has some really good flavor! Now someone smear that dip all over my face. I just recently discovered my love for red bell peppers. So much tastier than their icky green friends. May I please bathe in this dip? I want to dig into that bowl! It looks so good and the way you have the angle in the top photo, I want to just reach in! 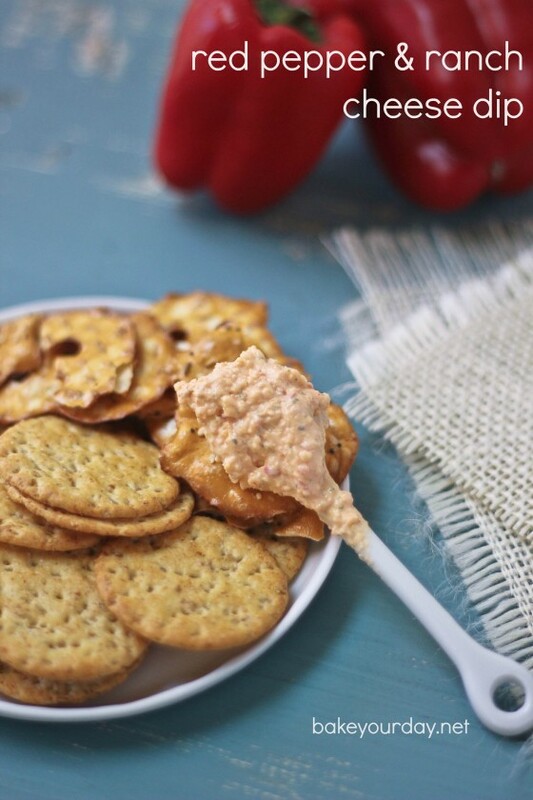 I love red peppers and this dip looks perfect for me! I love this dip!! I think I could live off of dips and appetizers! I love red bell peppers in dips, yum! My love for red bells is fairly recent, and now I want to get all up-close and personal with this dip. I’m sure we’ll become faaaaast friends. I love this! I seriously could put ranch and roasted bell peppers in everything. This will make it into my normal dip rotation for sure. That dip sounds amaaaazing! I am a huge snack person & this sounds perfect for game day! Yummmy! I don’t like red bell peppers on their own, but in dips or sauces…I’m smitten! This looks just delicious, my friend. Thank you for sharing. I need to make some chips and dip now! Such a tasty sounding dip, love that you ladies have come together to throw such a fabulous party! A tasty treat for the mama-to-be! A virtual baby shower is so cute! 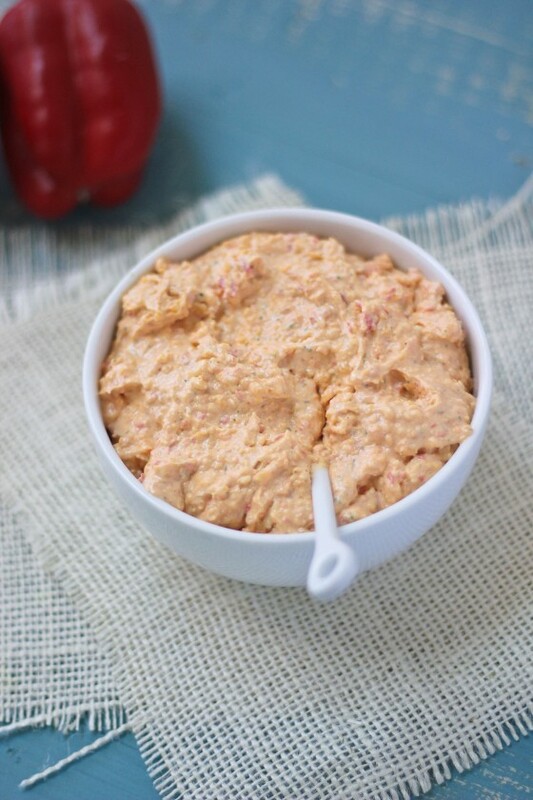 I’m not usually the biggest fan of red bell peppers, but in this dip, I would totally dig it! this sounds amazing – I love the flavor combination! This sounds so delicious, and is the perfect thing to make for a baby shower! Fun! My husband would go crazy for this dip. He loves bell peppers, creamy, cheesey, and ranch! I would love this, so delicious! That looks fantastic Cassie! Love the photography, too. And cute baby boy name! Awww you’re always so sweet to be a part of virtual baby showers! And this dip is absolutely killer! Happy virtual shower Krissy! This dip sounds amazing! Love the virtual shower – so sweet! This dip looks fab, I have a pot luck in a few weeks and I’m thinking this would be perfect!! I love this dip! I can definitely see it becoming a go-to for me! I am always looking for good dips for crackers and vegetables. This one certainly seems to fit the bill. Congratulations to Krissy! I’ve never been a huge ranch fan, but this? This I would most definitely eat! this dip looks incredible! i bet everyone is wishing the babyshower wasn’t virtual so they could try some! I’m definitely going to be making this. It has my family written all over it! While the bell pepper is a member of the Capsicum genus, it is the only Capsicum that does not produce capsaicin, a lipophilic chemical that can cause a strong burning sensation when it comes in contact with mucous membranes. (An exception to this is the hybrid variety Mexibelle, which does contain a moderate level of capsaicin, and is therefore, somewhat hot). The lack of capsaicin in bell peppers is due to a recessive form of a gene that eliminates capsaicin and, consequently, the “hot” taste usually associated with the rest of the Capsicum genus…’*.